What can I say? It’s choux-time again. This time the Daring Bakers made me do it. This month our challenge recipe is from none other than Pierre Herme, the king of macrons himself. I’m sure it’s been a long time since PH himself churned out batches of choux, but it’s nice to see that he doesn’t shy away from the classics. I’ve tackled choux before…many times. It was one of the first things I learned how to make in pastry school. It was one of the first things I made in the restaurant. It is one of the first things I think of when I want to make a quick pastry. I was a little bit surprised that we’d dare to make one of the basics, but if if Pierre was up to the task, then so was I.
Choux, in its most basic form, is a flour, butter, and water roux fortified with eggs. This mixture is usually piped out and baked until golden brown and delicious. We were provided PH’s basic choux recipe but I couldn’t help but spice it up, just a little. Choux lends itself well to additional mix-ins: cheese, herbs, compound butters, or in my case, cocoa powder. I substituted 40g of coca powder for 40g of the flour and just mixed it in like normal. No special tricks – nothing. I proceeded to beat in the eggs and pipe as normal. Everything worked as planned, they puffed, they cracked, they came out great. I couldn’t resist tasting one of the unfilled eclairs right out of the oven. It was warm, crisp, and overwhelmingly chocolate. A bit too much chocolate, actually. The cocoa powder did its job very well but the end result was a little more bitter than I anticipated. A plain vanilla or chocolate cream would not suffice here so I went more exotic. Inspiration hit me as I searched my freezer: passion fruit. As luck would have it, I had passion fruit puree buried in the back of my freezer. I checked the pastry cream recipe provided and realized I could alter it for my purposes while still keeping with the spirit of the original. First, I cut the recipe in half because I had a feeling there would be just too much. Then 75g of passion fruit puree was substituted for 75g of the milk. I finally decided to go with white chocolate in the pastry cream – I just love white chocolate and passion fruit. Other than the ingredient changes, everything else remained the same. After a quick trip to the stove and an hour in the refrigerator, the pastry cream was ready to go. I went out on a limb and created a quick passion fruit fondant glaze. A very small amount of white chocolate ganache was added to the glaze just to help it set up better. End result? Success. 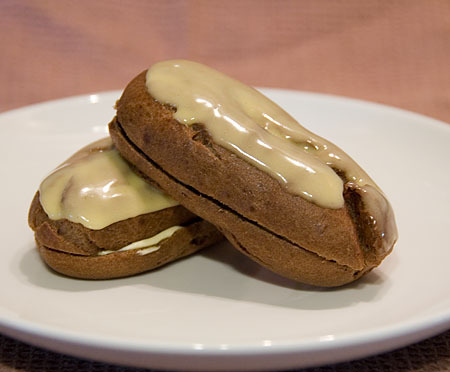 The dark, bitter chocolate choux blends nicely with the creamy white chocolate-passion fruit pastry cream and the sweet passion fruit glaze finishes everything nicely. I’m glad we made you do it because you did an amazing job! Good recipe site! I’ve bookmarked for futre reference. I am officially inviting your visitors to contribute their favorites to my new http://www.toprecipesource.com if they are interested! I’m pretty sure that passionfruit is grown in the Phillipines, but it’s probably known by a different name. In Hawaii they call it lilikoi. I believe there are several Spanish words for it, including grenadilla, parcha, and maracuya. It was extremely tasty. Well done! You could have fooled me! 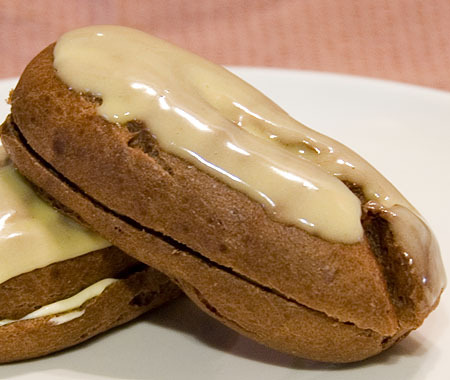 For only 1 sec I thought you’d made wholewheat eclairs! Then my brain caught up… Great idea, great execution! Beautiful eclairs! 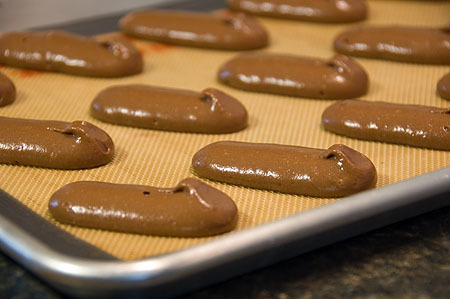 I love that you made chocolate choux pastry. I love your variation, looks really great! Not only are your photos gorgeous, but those eclairs look scrumptious, so much so that my fiance just said “Can you make the shells chocolate next time, like hers?” We’re both drooling at 3 am! I love so brown cocoa and so full of chocolate.